There are some who say that hot dogs are a simple man's food. Those people are called traitors, and they need to be tried as the turncoats they are, because the hot dog is a true symbol of American ingenuity. There are some who say that hot dogs are a simple man's food. Those people are called traitors, and they need to be tried as the turncoats they are, because the hot dog is a true symbol of American ingenuity (and one of the 50 most American foods): hand-held, inexpensive, and basically stolen from another country and relabeled as American. And while not all hot dogs are created equal, there are some out there, hidden among the stadiums and food carts of the world, that are fit for a king. Tracking down the best hot dogs in the country was not an easy task. But we traveled far and wide, consulted our in-house experts, and made endless wiener jokes in the pursuit of the nation's greatest tubed meat. We're sure to have missed some, too, so let us know where we should be eating in the comments section on our site. Hold the ketchup. 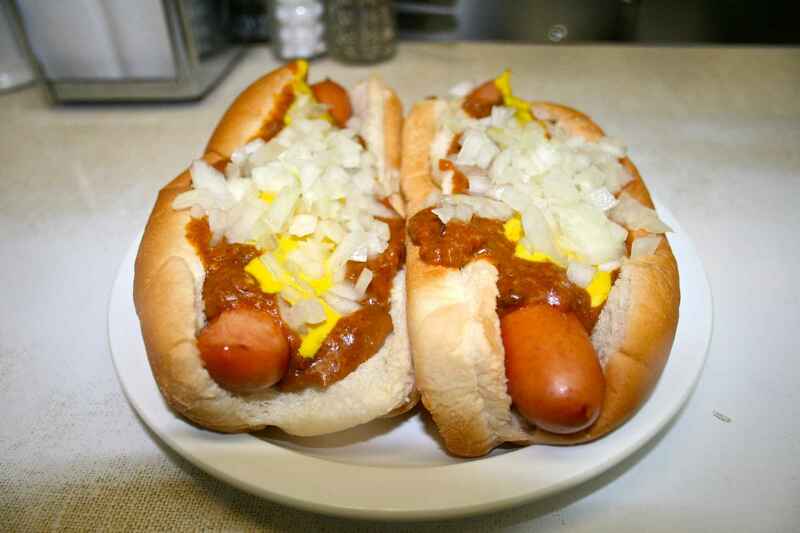 Look, we could split hairs like everybody else and say that the best coney is from Lafayette and American, the two pioneering Detroit hot dog joints that operate next door to one another. But that's a cop-out. 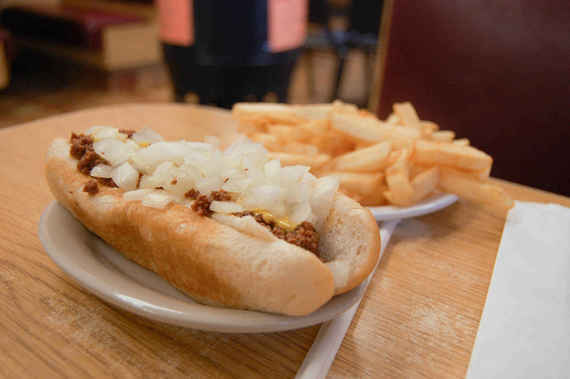 And we could go with any number of great, lesser-known coney spots in what this writer believes to be the second-best hot dog city in America (sorry, Flint Town for life!) -- Duly's, Leo's, Joe's, you name 'em -- but that would be denying the truth: Lafayette makes the best coneys in Detroit. Maybe it's the Spanish onions on top of that sloppy chili. Or maybe it's just everything about them, right down to the snap. Why are Maine's "red snapper" dogs bright red? Is it because, after so many lobster rolls, Mainers are confused by bunned foods of any other color? Is there a weird fetish about satanic nether regions? Honestly, we don't care why they dye the natural-casing wieners bright red. All we care about is how good they taste, especially when steamed up by Simones' (you can get them grilled too... don't) and served with a little splat of chili and cheese. Like a lobster roll, they're served on a split-top bun. Unlike a lobster roll, they'll cost you $4. 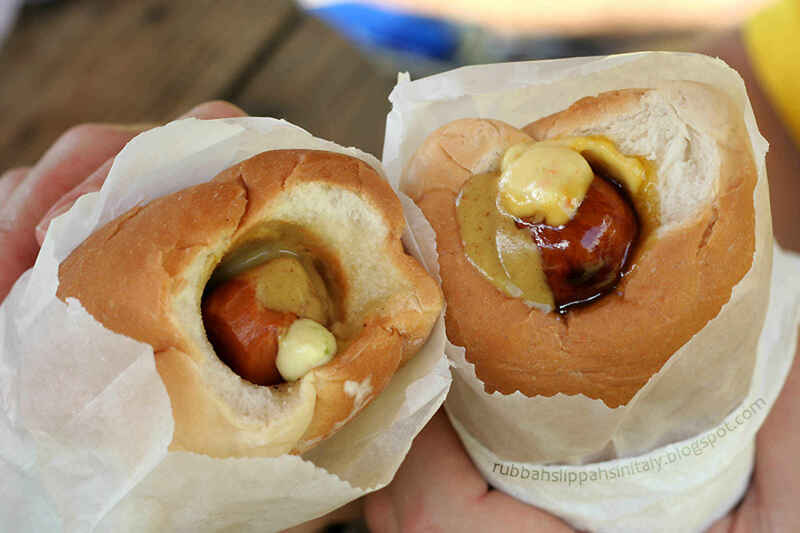 Pukas are not just those shells your bro Chad insisted on wearing throughout his college career; they're also Hawaii's contribution to hot dog culture. In an act of reverse engineering, a hunk of sweet bread is impaled on a hot stick, effectively toasting it from the inside while leaving the outside fluffy. It also leaves a hot dog-shaped hole in the bun. Luckily, it's a hot dog place. In goes the Polish dog, on goes the fruit relish, and up goes your cholesterol. It's magnificent! Look, we're not saying you shouldn't go to Ben's Chili Bowl for a half smoke, the DC area's big, fat, smoky take on the hot dog. Go. Get crammed in. It's worth it. But we are saying that you should also be hitting up Weenie Beanie, which claims to have invented the damn thing at its original (and now ony) location, and still makes perhaps the best, sans the hype. It's a simple, old-school walk-up window that opens at 6am daily... the perfect time to top a half smoke with a runny egg. Yeah, everybody and their mother calls out Daniel Contreras' hot dog stand for being possibly the best Sonoran dog in the country. But guess what? Mom's sometimes right. The bacon-wrapped frankfurter is topped with chopped tomatoes, pinto beans, a pinch of onions, a line of basic yellow mustard, jalapeño sauce, and a squiggle of mayo. 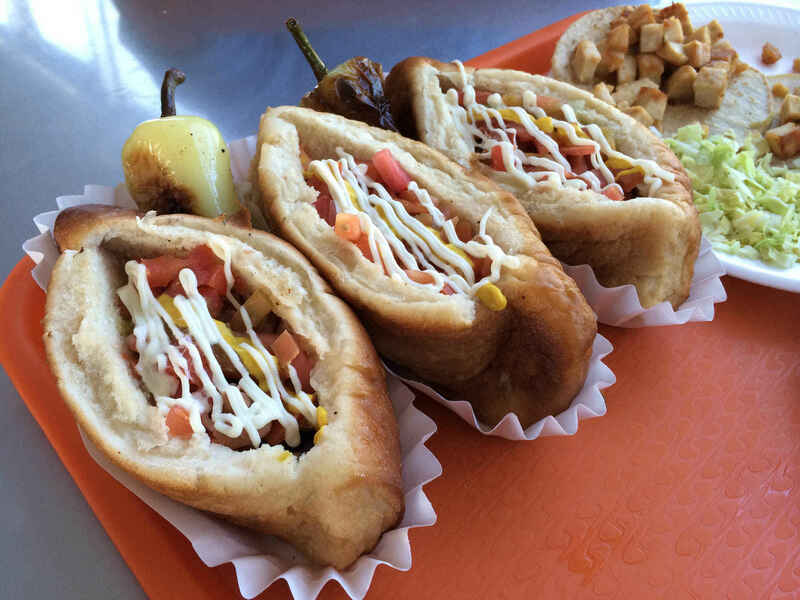 It's basically a hot dog burrito, but with a Mexican bolillo roll instead of a tortilla. Every dog here is the same. No substitutions. No problem. Oh, sure, it's on the National Registry of Historic Places. So are 90,000 other places, and most of them don't have hot dogs. So what makes Walter's -- housed in a Chinese-looking roadside pagoda since 1928 -- so special? Butter. That's right. Walter's pork, beef, and veal dogs are grilled and crisped in delicious butter before being split, hit with butter sauce, then grilled again... in butter. Go easy on the toppings here. A little mustard will do the trick. Flint-style coneys differ drastically from their Detroit brethren. First, instead of the wet, gloopy Motor City chili, Flint's got a dry, all-meat chili made from random offal and ground-up hot dogs (mustard and raw onions remain essential). Second, a true Flint Town coney is 100% local, thanks to the city's Koegel Meat Company, a factory that makes, for my money, the best goddamned hot dogs in the country. And nobody knows how to treat a Kogel vienna quite like Angelo's, which makes its own sauce and grills the dogs to a snappy perfection 24/7. Flint has undergone a ton of changes over the past 70 years. The one constant is Downtown's Angelo's, where coneys and gravy fries are sometimes all the light you need. There's a little bit of everything on this Berkeley institution's menu, from Louisiana-style hot links to brats, linguiça, and an excellent smoked chicken sausage with apple. But the franks -- grilled just enough to keep the snap in tact -- are the draw here, loaded onto a grilled sesame bun. The kosher all-beef frank is a thing of simple beauty, but our hearts are set on the German-style version, which throws a little pork and garlic into the mix for a little extra oomph. 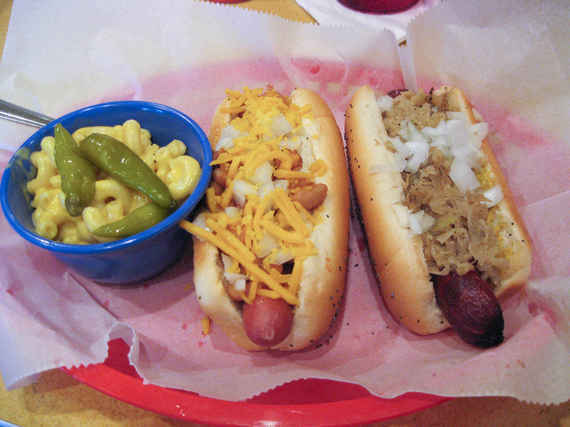 The Vienna Beef dog and the poppyseed bun at this Columbus place might make you think it's aping Chicago -- and, indeed, it does in fact have a Chicago dog on offer -- but Dirty Franks is like a national tour of styles, from coneys to Sonorans to Southern slaw dogs. But when this place gets frisky, it really goes off. The Cowgirl Carmen is like a cross between a Detroit dog and a Frito pie, while the Sarva's comes covered in tot-chos, which are exactly what they sound like. There's also the Glenn Beck, cleverly described as "a plain, old wiener." Unlike its namesake, it's also pretty great. While trendier Floridian places are bastardizing the great American institution of the hot dog by trying to make it healthy with fish and tofu and other crap, Hot Dog Heaven's been offering a taste of Chicago that has made it a classic. Nothing too fancy here. Just delicious Vienna Beef on a steamed poppyseed bun, dragged through the garden or hit with cheese, kraut, chili, or slaw. And lest the place's dingy appearance and simplicity make you think it's just a standard hot dog spot, take note: none other than Vienna Beef named it the first National Historic Vienna Hot Dog Stand in the country. Oh, and the burgers are good too. But get the hot dog. To find out what other spots made it onto our list of the top 21 hot dogs in the country, get the full story at Thrillist.com!